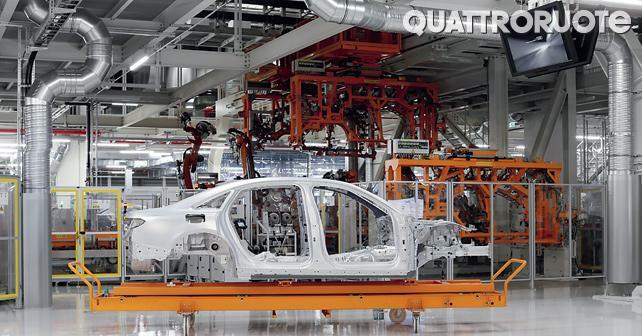 The fourth-gen Audi A8 is the first production model designed by Marc Lichte, marking a new era for the German brand. Not only that, it also comes with a slew of futuristic technical innovations – along with a Level 3 autonomous driving system. “Good morning, Roberto!” – that’s how the car welcomes you – by calling out your name, whilst simultaneously adjusting the seats, air-conditioner and radio settings, according to your preferences. You slide inside the plush cabin, turn the ignition on and the navigation, which is a self-learning system that learns from past experience and suggests a number of destinations based on the places you drive to frequently. You crank the engine, it hums to life in a restrained manner, the suspension stiffens up and the steering wheel becomes hefty. You then see a nice country road ahead, full of corners stretching out in front of you – which is why the vehicle sets the drive mode to ‘Dynamic’ automatically, ensuring that you have more fun behind the wheel. Once you reach the open highway, the car switches to ‘Comfort’ mode automatically. But what about when there’s traffic up ahead and you’ve got to wait in a queue? No problems, Sir! At a touch of a single button, the artificial intelligence takes over the controls and drives you through the traffic – you can relax, distract yourself with your smartphone, or even read a book. Frankly, you don’t have to even move a limb when you’re travelling in it. Welcome, ladies and gentlemen, on board the brand new Audi A8. It can accelerate, brake and steer on its own! Audi officials emphasise that the new A8 is going to represent a turning point for the brand. It’s the flagship sedan, so, of course, it’s a very important model. 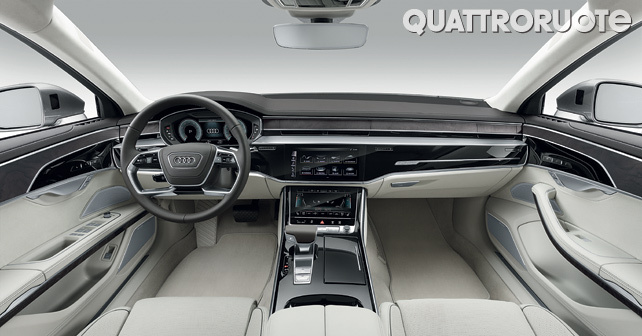 From the design to its innards – every aspect of the new A8 marks a new beginning. But, truth be told, among the sea of technological innovations it exhibits, the launch event of the car saw the whole attention focused on just one single highlight – its Level 3 autonomous driving system. Widely anticipated by its manufacturer, and strongly amplified by the media, the self-driving system is the most advanced (and intriguing) element of the new Audi A8’s feature list. So does it live up to the hype? Well, yes – but not entirely. And there are a few reasons why it’s not a complete innovation just yet. 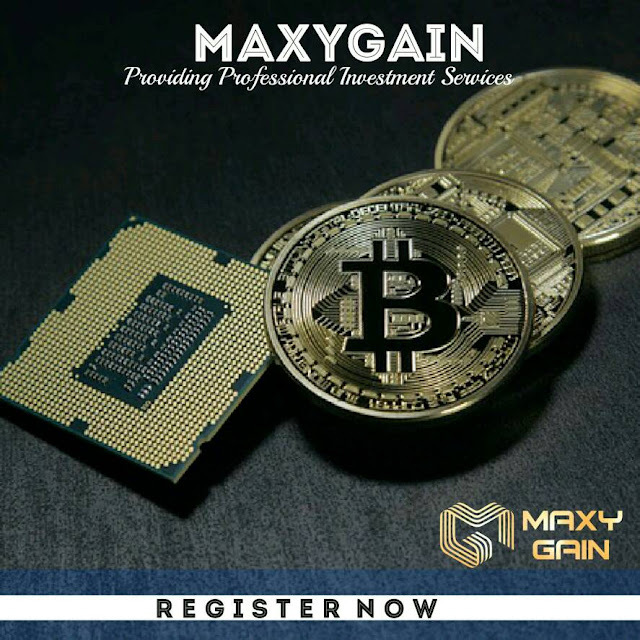 First, the actual adoption of the system will depend on different markets’ regulations. Second, the A8, compared to what the semi-autonomous system on the A4 does today, only allows the driver to take his or her hands off the steering wheel in low speed traffic of up to 60km/h. In short, a car that can do complete chauffeur duties in each and every situation is still far away. That said, the A8 takes a giant leap forward in this direction. Within the label of Audi AI – which stands for artificial intelligence for the brand’s futuristic mobility solutions – the traffic jam pilot system of the new A8 works in conjunction with remote parking pilot or remote garage pilot system that helps park the vehicle without the driver, either within a space bordered by stripes or in a box. To allow these manoeuvres, the car comes equipped with a combination of cameras, radars, sensors and lasers – the collected data of which is processed by a driving assistance control unit. Once we were done with this technology tasting tour – albeit there was much, much more to try – it was time to focus on another key element of the new A8, its design. Ever since the new Audi A8 went into development, we’ve been eager to find out what the new A8 will look like? 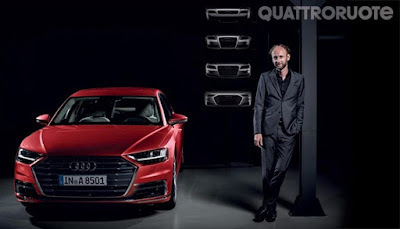 And since it was going to be the first production Audi to be designed by the new design head, Marc Litche, the anticipation surrounding this new luxo-barge continued to build right until its launch day. When you lay your eyes on Lichte’s debut Audi design in production form, you find more confirmations than surprises. In a way, it’s greatly inspired by the Prologue concept – which was sort of expected. You could, however, say that the boldness of the concept has been toned down in the production version. 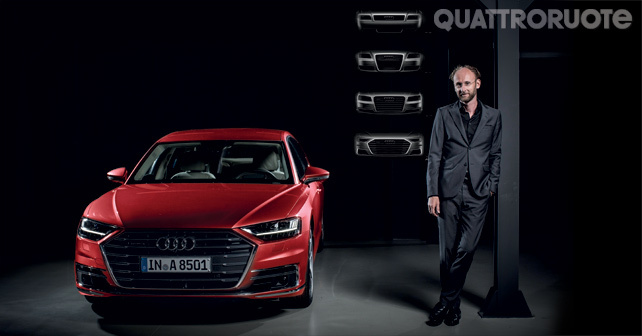 There are similarities though – the radiator grille had been widened and lowered, giving it a massive front, while the rear-overhangs and protruding fenders highlight the fact that Quattro all-wheel drive is one of the main elements of its identity. In fact, four-wheel drive comes as standard in the new A8. But, as far as its dynamic qualities are concerned, all-wheel traction isn’t just the only thing here. The flagship Audi saloon comes with a raft of new technologies. First off is the progressive steering and adaptive air springs. The suspension can be set to four different ride heights, while three driving profiles are on offer – Comfort, Auto and Dynamic. In its sportiest setting, the car lowers the ride height by 20mm once the speedo crosses the 120km/h mark – thereby improving aerodynamic efficiency. For those looking for something extra, there’s an optional sport differential, which optimises the torque transfer ratio on the rear axle. If the aforementioned solutions don’t float your boat, don’t worry, there’s a whole lot more on offer. With the new A8, Audi is also offering something called Active AI suspension on certain models. Understanding how the whole system works is a bit of a head-scratching affair. It’s a system that has an individual electric actuator for each wheel in order to vary the load on each wheel depending on the road conditions. What’s remarkable is that this system also intervenes in case of an imminent side collision. There’s a pre-sense, or predictive device, that lifts the car’s frame up by 80mm to protect the passengers sitting on the side where the point of impact is likely to occur. 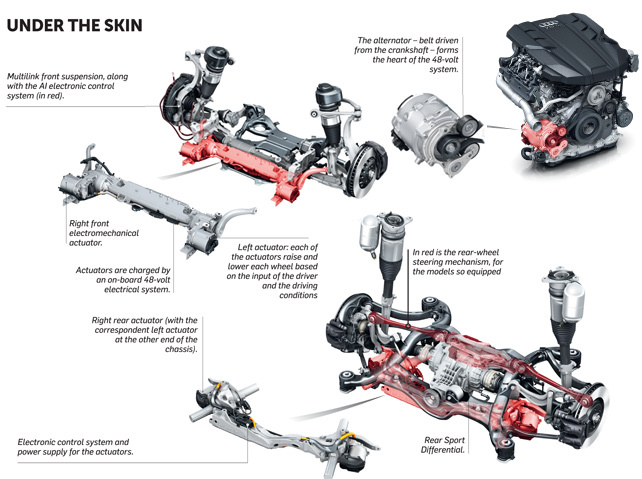 And there’s more – it also has four-wheel steering. At high or medium-speeds, the rear tyres turn in the same direction as the fronts to increase stability. In low speed conditions, such as while parking the vehicle, the rear wheels turn in the opposite direction to enhance manoeuvrability of a car that’s 5,170mm long (the India-bound A8 L is even longer at 5,300mm). The new A8’s powertrain options include a couple of V6 engines – a 3.0-litre TDI generating 282bhp and 600Nm of torque, and a 3.0-litre TFSI rated at 335bhp and 500Nm. There are also 4.0-litre V8 diesel and petrol engines that produce 430bhp (TDI) and 453bhp (TFSI) respectively – the latter comes with cylinder deactivation. Eventually, there’ll be an exclusive W12 petrol on offer. This range-topping version will only come in the A8 L, headlined by a 6.0-litre twin-turbo petrol engine with 580bhp and 800Nm on tap. This will also get cylinder deactivation technology, which shuts the left bank of the engine under low load conditions. Irrespective of the powertrain, the transmission duties will be carried out by an eight-speed Tiptronic automatic gearbox. All engines come standard with mild-hybrid start-stop systems that run courtesy of a belt alternator starter, powered by a 48-volt network. The state-of-the-art interior is classic Audi, but it’s even more refined now – there are hardly any knobs or physical buttons since they’ve been replaced by touchscreens. Reduced dimensions, in line with the headlights, and horizontal development – this was the grille of the A8 back in 1994 (see the topmost photo). It was replaced in 2002 by a single frame grille, designed by Walter De Silva (second from the top) – significant dimensions and vertical development was introduced for a strong brand image. Then, in 2009, the single frame was enlarged and became more hexagonal (third photo from the top). On the new generation model, the grille is still big, but follows a horizontal development (above). On the side is the head designer of Audi, Marc Lichte. A 10.1-inch screen, which is equipped with haptic feedback, is the heart of new MMI touchscreen system. There’s another 8.5-inch touchscreen right in front of the gear selector. The smaller touchscreen manages air-conditioning and comfort functions (massage seats, etc.) and allows you to save radio stations, phone numbers and itineraries. Just like the current model, the new A8 will also be manufactured at the brand’s historical factory of Neckarsulm in Baden-Wurttemberg. 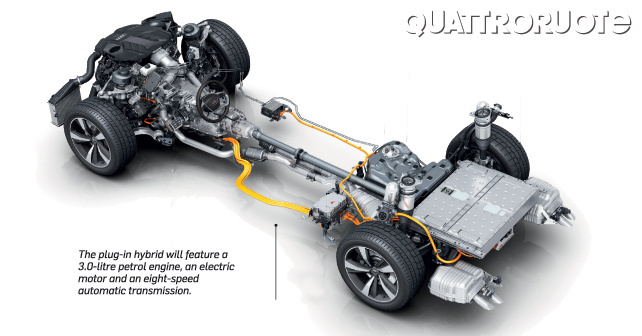 Approximately 500-kilometres of range in electric mode – this is the zero emissions autonomy envisaged for the A8 e-tron, which is the hybrid plug-in version of the new model. This is expected to go on sale soon after the conventional powertrain versions of the car are launched. The hybrid powertrain will combine a 3.0-TFSI petrol engine and an electric motor, delivering a total system output of 443bhp and 700Nm of torque. 0-100km/h will be achieved in 4.9 seconds. With the navigation system activated, the vehicle can also decide if it wants to save energy on the highway by switching to electric power alone.